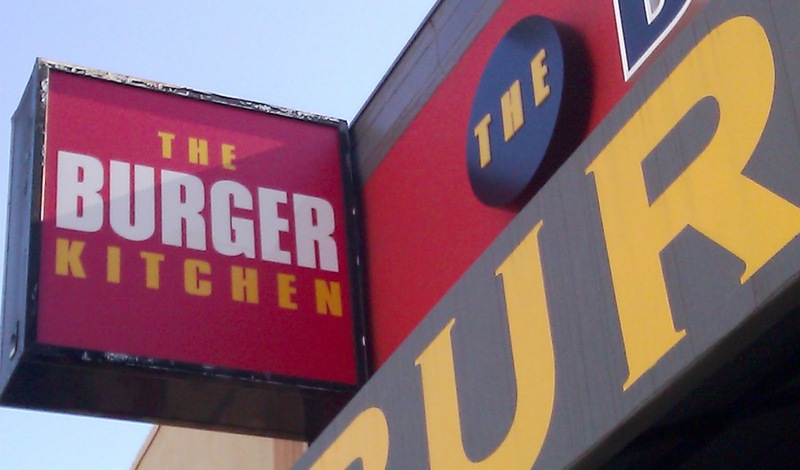 The Burger Kitchen had recently been featured on Kitchen Nightmares. The son, Daniel, had taken over the operation and sent father, Allen, off to do other things. Fat Bruce Lee and I were curious to see if the Gordon Ramsay treatment had delivered or fizzled in terms of burger success. We walked into a completely empty restaurant at 12:30 PM on a Thursday afternoon in a section of Mid-Town Los Angeles, which was otherwise bustling with foot and vehicle traffic. We were quickly seated and handed a couple of shoddily photocopied order sheets,which oddly made no mention of the name of the restaurant on them. 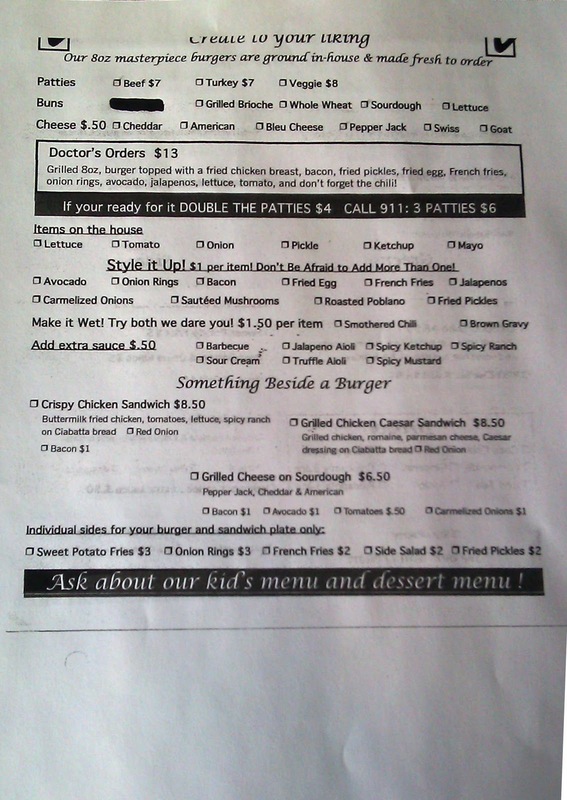 The formerly sizable and descriptive The Burger Kitchen menu had been stripped down to a couple of items and a fistful of sides and toppings. 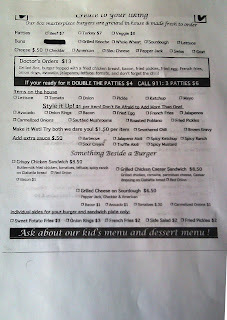 We ordered a couple of the 8-ounce beef burgers with American cheese and a couple of sides. Our burgers arrived in about 15 minutes. We did find it especially charming that the manager's girlfriend ran out to her car to get Fat Bruce Lee some Splenda for his iced tea. The Beef: The burger beef was a combination of 45%, wet-aged Short Rib and 55% Chuck. The fat content was 22%. It was unfortunate that the beef was aggressively over-salted. I was forced to dig into the middle of the patty to determine the flavors. 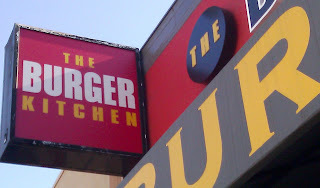 What I discovered was a very competent and tasty burger. The blend delivered a medium note of beef. There was a mild taste of iron. Missing were funk and blood. The beef was juicy and with just enough fat to remind me that it was bad for me...in a good way. The grind was medium. Overall, the beef was better than average, but the seasoning overwhelmed the beef to the point where determining the actual flavors was an academic exercise. The Seasoning: There is no point in belaboring this. Curiously, when I brought this up with The Burger Kitchen's manager, he simply thanked me for my input. And so it goes. The Sear: The crusty sear from the flat-top was no more. What we got instead was a competent sear from a properly hot gas grill. The sear was satisfying and semi-crisp. The Preparation: The burgers were competently cooked to the requested Medium. 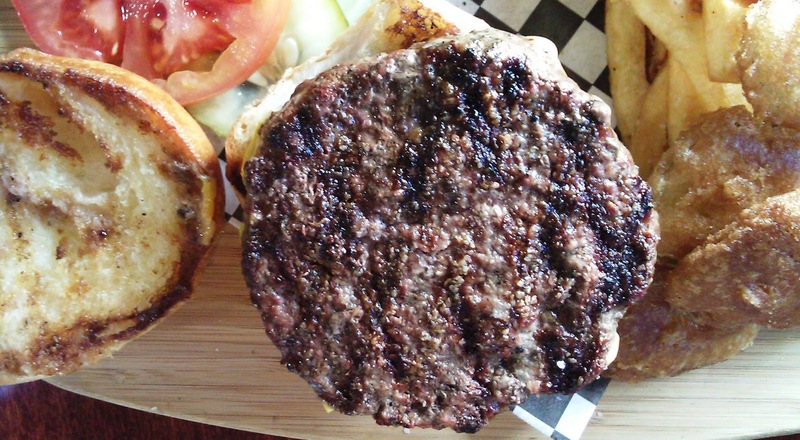 The beef was ground in-house, and it was formed into the 8-ounce patties during shift prep. Care was clearly taken not to over-manipulate the beef when creating the burger patties. The bite was firm but tender enough not to be considered chewy. The Cheese: The Burger Kitchen offered up a nice range of cheese choices (each for an additional $.50): Blue, Goat, Cheddar, Pepper Jack, Swiss, and American. I selected the American cheese. It was perfectly melted, and it provided a desirable creaminess to the bite. The seasoning masked any flavor contributions, which the cheese could have made. The Bun: The brioche at Burger Kitchen came from Napoleon Bakery AKA Melrose Bakery. The brioche was neutral and surprisingly firm and chewy. This was not unpleasant, but it was very un-brioche-like. 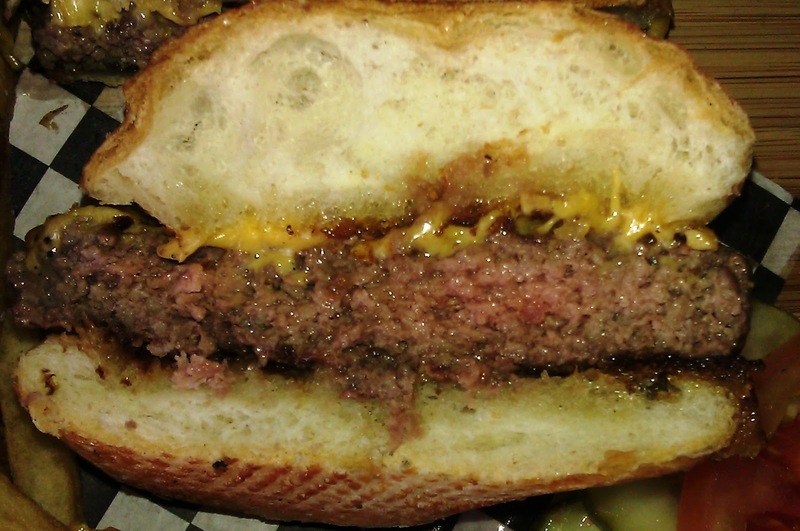 The bun was toasted to a satisfying crispness, which lent a nice texture to the bite. The Toppings: The shredded Iceberg lettuce was just ok, but it was a little on the wilted side. The tomato slice was hearty and refreshingly ripe. The Sides: Both the fries and the fried pickle chips were cooked in oil, which was at least a day past its prime. As a result, the fried items tasted a little rancid and more than a little burnt. The pickle chips oozed an unpleasant puddle of oil onto the plate. The fries had a good color, but they were a little on the gummy side. The fries were seasoned with sea salt. The Value: Had the burger not been salted to death, the value at The Burger Kitchen would have been fine. $7.50 was not a crazy price for a cheeseburger. Considering the over-seasoning and the burnt-tasting fries, I was not a fan of the value on this visit. I had watched the episodes of Kitchen Nightmares, which featured The Burger Kitchen, so I understood the unenviable position that Daniel Saffron, owner and manager, found himself in. Sympathy aside, the burger was merely OK, and it was not the sort of thing that I would return for. 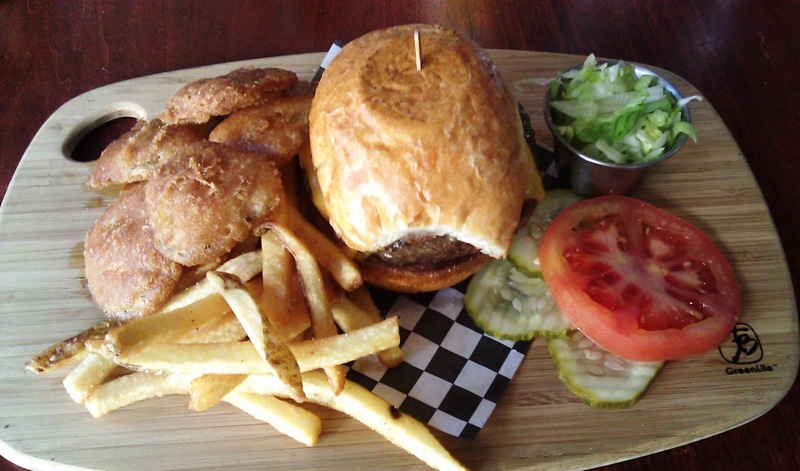 Burger Review : The new Burger Kitchen featured a scaled back menu in terms of selection. The burgers and fries both came up lacking in terms of preparation. You can give someone a recipe and teach them how to cook it perfectly, but you can't teach them the important stuff like not keeping old shortening/oil in the fryer. That is what is increasingly becoming uncommon sense. I feel bad for Daniel. Daniel caught some bad luck. I hope all turns out well for him. What crappy parents. Who takes from their kids? LOSERS... Is dad was shaddy. The mom a joke. This is why no one should leave someone eles money in anothers hand. Good Luck to Daniel...maybe the money sucking parents will leave him alone. I honestly hate the mother. She is the real ballbreaker of the family. I watched the episode of Kitchen Nightmares and the mother seemed like and incompitant bloodsucker. All she did the entire episode was wine and call out others. The father is a true money hog. The way he can just take 250k from his son is just sickening. I get pissed when someone takes 20$ from me. I cant imagine having to live with the fact that my own father would take my money. Hey Jose, can we readers also get "pissed" at your careless spelling of "incompetent" & "whine"? the spelling is not the important part, its sad these losers think it is. It isn't how the words are spelled, in this case, that is important. It is what the words mean. I guess I should mention the poor grammar by "Anonymous October 10, 2013 at 7:59 PM". Very poor grammar. Especially the run-on sentence half way down. You're making the older generation look bad. It's truly hilarious to see someone complain about someones spelling when they use the @ symbol rather than hitting the letters a and t. Oh also this phrase "video games & rappin' death-shooting music are the new morality trends in life" is a pathetic excuse for proper English. You also wrote "LIKE THIS-->". I mean are you serious? "Spell rightly," spell rightly? Someone should give you an English lesson because the correct phrase is 'spell correctly'. "Spell rightly" is possibly the worst grammar I have ever read. So I'm assuming "Soc, Sec." is supposed to stand for social security. Now if that is the case I have news for you, social security has been dead for years. "Spelling-is-fun-da-men-tal." This is also entirely incorrect. Also, in correct English you should not use the symbol &. Also, In correct English you should write the words twenty thousand and thirty and twenty thousand and forty rather than using numerals. Now I want to end this by saying that I am now English expert. I simply wanted to point out that you made more mistakes than than of the person you were claiming couldn't type in a proper manner. We all make mistakes when we write. This is why editors exist. The most famous writers that have ever existed had their works of art proof read. The importance of writing and communication as a whole is that we communicate ideas not that we have perfect spelling or grammar. I am not suggesting that we should not strive for perfect spelling and grammar but to suggest that someones ideas are invalid because they spelled a word wrong is completely ignorant. Oh wait I forgot to point out this terrible grammar "Your badly spelled words" It should be, your poorly spelled words. Hey, spelling Nazi! Perhaps you should check your grammar: "more correctly"...?? Smooth. This is either from one of the parents or a family member, not Daniel. Can you Grammer Corrector, focus on the story on how either you or whoever related to you is trying to divert attention to a young man who was ripped off, robbed from his parents? Try sending that poor young man the money stolen from him. You're not my teacher & I didn't read a post that talked about the story then say "anyone out there want to review my spelling & grammar? " so stick with the story. it all looks like a bunch of overacting drama queens who are just starting out as actors because I overreacted all their parts. What a piece of (s) hit to steal your sons money and throw it away. You owe him 1/4 million dollars for being an idiot! Shame on you as a father and mother. Y'z er uall talkin bouts mizpelin wen itz bout dis ked getten RAPED Financially by his Halitosis A hole of a father and his Overly Dramatic B'otch of a mother? These two dip Shiites should have never got into a restaurant business in the first place. The father wrote a book on how bad his father was, is he going to write a book on how to screw your children over next? I can't wait, I hope there's a book signing. Dan should have fired his parents a long time ago and listened to Chef David on his menu ideals and there are to many Latino's in the kitchen cooking, I mean they even mess up my fast food at Del Taco and El Pollo Loco not to mention Yack in el Box and Milkdonals!